The Yuanbaoshan fir and the Ziyuan fir are on the edge of extinction, but effective conservation interventions for either species have been completely lacking.This project aims to improve their conservation status through protecting remaining trees, reinforcing existing populations through planting and by building the capacity of local nature reserves and communities to continue conservation measures in the future. Yuanbaoshan fir (Abies yuanbaoshanensis) (CR) and Ziyuan fir (Abies ziyuanensis) (EN) are two of the most highly threatened tree species in China. Both species face threats from habitat degradation, limited natural regeneration and climate change, have small and declining populations and are endemic to a restricted area. The Yuanbaoshan fir occurs only within Yuanbaoshan National Nature Reserve (NNR) in Guangxi province with a global population of less than 300 individuals. The Ziyuan fir is known only from three areas in Jiangxi, Hunan and Guangxi Provinces, including an important population in Yinzhulaoshan Provincial Nature Reserve (PNR), and is thought to number less than 600 individuals. Although on the edge of extinction, effective conservation interventions for either species have been completely lacking. 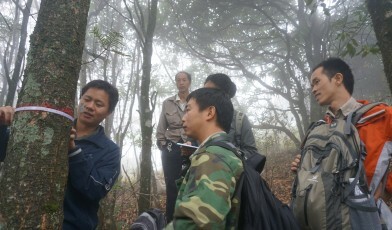 Recognising the need to raise local capacity for tree conservation, the Global Trees Campaign, in collaboration with Guangxi Institute of Botany, provided training to technical staff from Yuanbaoshan and Yinzhulaoshan NRs and helped them secure seed funding from the Flagship Species Fund in 2012. Through this initial support, both reserves completed a conservation status assessment and developed conservation recommendations for these two highly threatened Abies species. The project has recently gained support from SOS – Save Our Species to implement these recommendations on the ground. The two year project, coordinated by Fauna & Flora International’s China programme, aims to make an effective contribution towards improving the conservation status of both species. Actions will be carried out by a multi-stakeholder team involving FFI, local authorities, a scientific institution and local communities and will be complemented by on-going training for nature reserve staff, allowing the project to leave a lasting legacy. Two nature reserves will implement a number of management interventions, including patrolling, monitoring and targeted control of pioneer species (that inhibit natural regeneration of Abies sp.). Populations from both species will also be boosted through propagation and planting. Finally, nature reserve staff will be supported to attend training courses and exchange experiences and knowledge with other nature reserves working in Southern China. A conservation consortium involving all key stakeholders will be established, providing a basis for continued conservation of both species in years to come. The makore tree (Tieghemella heckelii), itself threatened by logging, provides an important food source for forest elephants in Central Africa. Read more more about trees with important ecological roles.